Fr. Gary Koenigsknecht was ordained in June 2014 with his identical twin brother, from a family of 10 children. Twenty-two priests from their home parish, Most Holy Trinity Catholic Church in Fowler, MI have been ordained. Fr. Gary says being a priest is the greatest joy and honor of his life, especially at the hospital, seeing Christ working through him for those most in need. Fr. 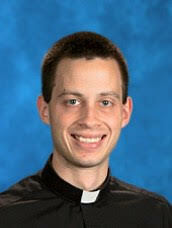 Gary is the Parochial Vicar at Holy Family Catholic Church in Grand Blanc, MI.